AUSTIN, TEXAS (May 25, 2017): Catalyst, an Austin-based agency specializing in marketing for student and multifamily housing, was recognized at the 23rd Annual Communicator Awards for its creativity and innovation in reaching millennials. The agency was recognized with the highest honor – the 2017 Communicator Award of Excellence for Integrated Campaign for its Renewal Campaign 2016 that directly resulted in 398 leads. 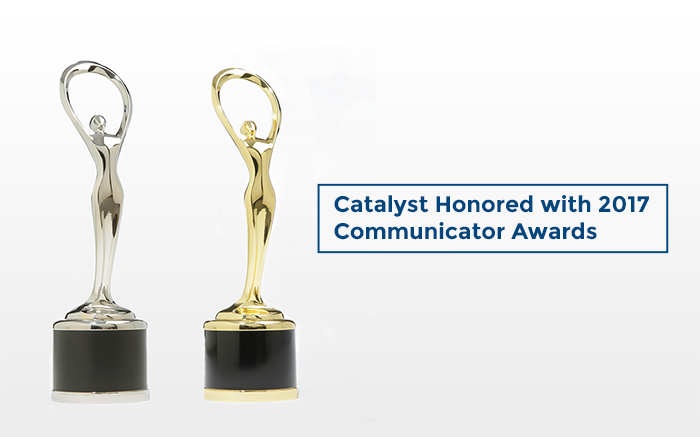 In addition, Catalyst won the 2017 Communicator Award of Distinction for Integrated Campaign for its Spring Campaign 2016 – and two 2017 Communicator Awards of Distinction for Real Estate Websites, Parker 301 and The Villas at Riverbend. The award-winning campaigns were designed for Campus Advantage, a provider of student housing management, development, acquisition and consulting services, and targeted college students nationwide. Deliverables included promotional videos, social media graphics, emails, associated landing pages, banners, and signage tailored for each campaign that were scalable and cost-effective at the property level. With the highest returning resident ratio in industries it serves, Catalyst has a proven track record of driving leasing and renewal rates for its clients. Combined, the Renewal Campaign 2016 and Spring Campaign 2016 resulted in more than 1,000 students attending leasing events designed to attract new residents and re-sign existing ones. With more than 6,000 entries received from across the United States and around the world, the Communicator Awards is the largest and most competitive awards program honoring creative excellence for communications professionals. Catalyst is an award winning, full-service digital marketing and communications agency specializing in student and multifamily housing, commercial real estate, residential real estate developments, and retirement communities. The Austin-based agency’s data-driven approach generates measurable results, and its clients therefore benefit from the highest returning resident ratio in their respective industries. Catalyst’s in-house team provides its clients with integrated brand, marketing, design, and public relations services, leveraging the latest technology advances and Millennial communications strategies.